10. 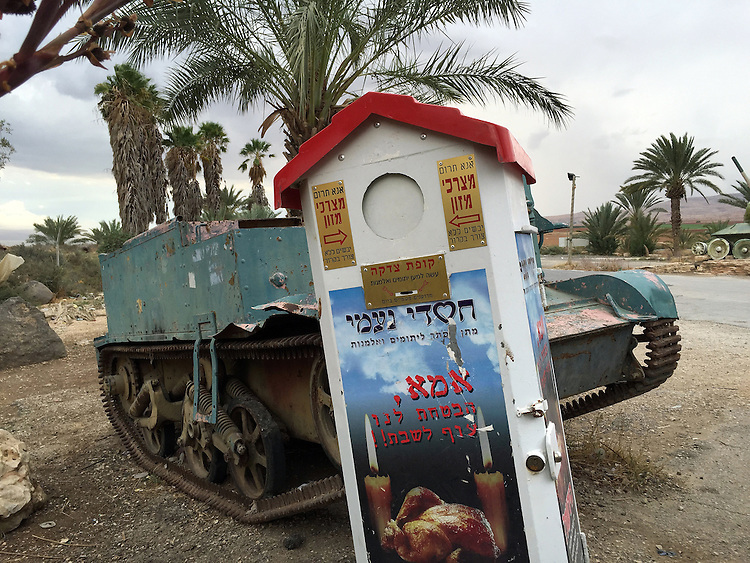 "Charity for the Orphans and Widows": alms box with abandoned tank outside cafe, Jordan Valley. Maintained by the Charities of Naomi, this alms box is designed for weekly collection of non-perishable foodstuffs for orphans and widows. Yet it tilts crazily as if it's been hit by the abandoned tank behind it. I was struck by the incongruity of "chesed" or "loving kindness," paired with the violent legacy of the tank. Moreover, the picture of the plump roasted chicken with candles is accompanied by these words: "Mother, you promised us a chicken for the Sabbath." If the children are orphaned and the mother widowed, this is indeed a grim reminder of the casualties of war.